2. The filled in application (soft copy) without annexure should be sent through email at recruitment.mhc@gov.in on or before 10.06.2018. No acknowledgment will be issued with regard to the e-mails submitted once and the candidates are required to verify all the details mentioned in the application before sending the e-mail. NO FURTHER CORRESPONDENCE IN THIS REGARD WOULD BE ENTERTAINED by e-mail. 3. 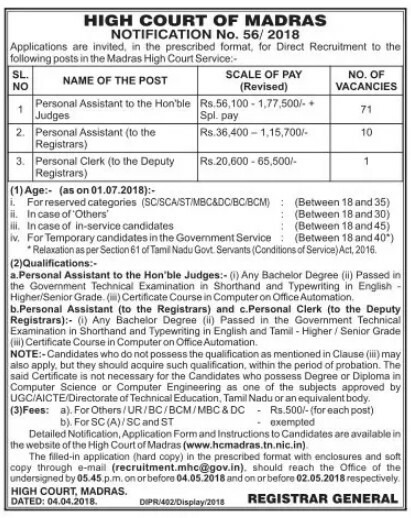 A print out of the Application submitted through e-mail shall be sent, along with required enclosures and the Demand Draft (if need be), by Registered post to the Registrar General, High Court, Madras 600-104 and the same shall reach the office of the High Court, Madras 600 104, on or before 14.06.2018, by 5.45.p.m.